With a fun blend of hip urban and friendly neighborhood ambience steeped in organic and artisan roots, The Grove serves up a hearty breakfast and lunch menu as well as coffees, teas, beer, and wine. With spacious indoor and covered patio dining, the cafe also sports an enviably large parking lot along Central Avenue. About halfway between Albuquerque’s Downtown and I-25, the restaurant attracts students, professionals and folks like us who trek across the city for homemade breads and pastries. The cafe is bright and airy with high ceilings, lots of windows and interspersed with little shelves and tables of unique and fun gifts for the foodies in your life. Oh, and did we mention the pastry display case filled with signature cupcakes and pastries? We opted for the all-day breakfast menu. 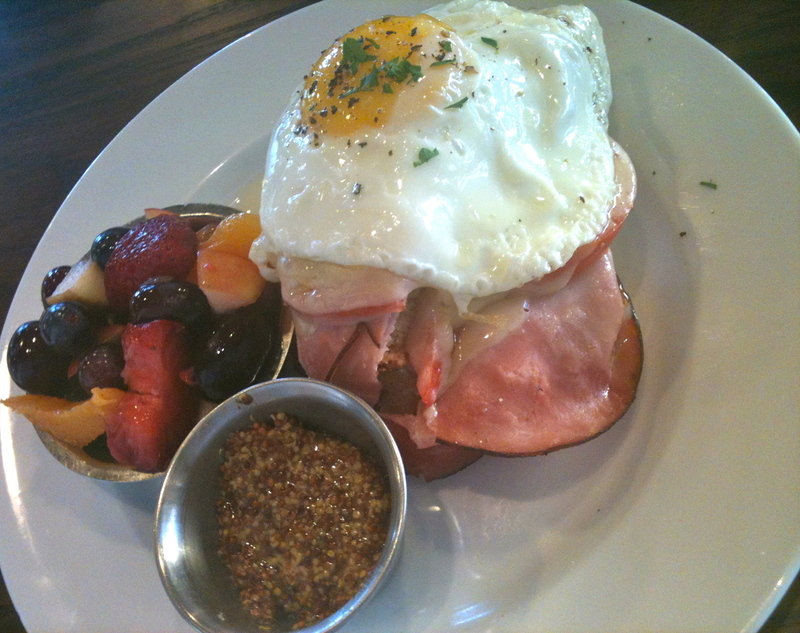 The CROQUE MADAME with fresh fruit came highly recommended, and we weren’t disappointed. Stacked precariously high, the dish begins with a base of fresh baked bread topped with black forest ham, tomato, gruyere cheese and a sunny-side-up egg alongside a sweet mustard topping. The eclectic blend of flavors and fresh, organic ingredients make this breakfast dish not only one of their most popular but also one of their most unique breakfast offerings. 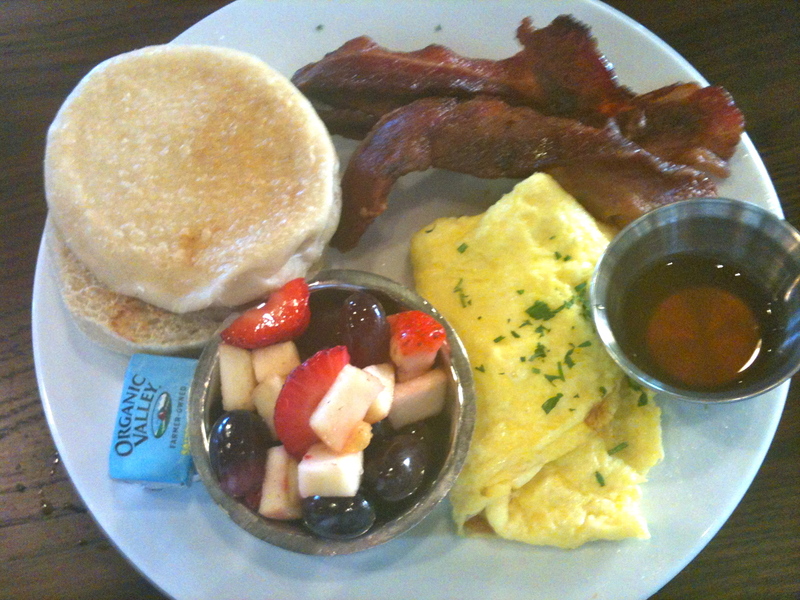 The friendly staff were more than willing to let us mix and match off the menu, so we also chose the CLASSIC SCRAMBLED with applewood smoked bacon (or tulle’s sausage), opting for one of the homemade English Muffins over the toast that regularly comes with the dish. And by English Muffin, we mean a beast of light, airy bread, gently toasted and still chewy in the center – hands down one of the best English Muffins we’ve sampled. The eggs were a bit plain – not even a hint of cheese in the scramble, but perhaps that’s our Southwest roots showing – where we usually like our eggs served up with a tasty salsa or red chile sauce. The restaurant also offers catering and boxed lunches as well. This entry was posted in Restaurant Review and tagged Albuquerque, APPCityLife, breakfast, City Guide, iPhone app, New Mexico, Restaurant Review, The Grove. Bookmark the permalink.